Most businesses depend on effective product fulfillment. If you regularly ship out products to your customers, those customers likely depend on quick and secure delivery. Order fulfillment involves more than just the delivery of products, though. Effective fulfillment also entails warehousing, packaging, and inventory management solutions. Product fulfillment can take a lot of time, especially if you are just starting out as a business. If you're looking to improve the way you fulfill orders as a company, it's important to compare outsourcing and insourcing product fulfillment. In this post, we look at the advantages of both methods so you can choose what's best for your company! Insourcing product fulfillment involves processing all orders yourself. If you are a new small business owner, you likely already insource product fulfillment. This may mean working out of your basement to wrap, label, and package products. In-home order fulfillment often means keeping the bulk of your inventory at your actual house. But it doesn't have to! You can insource order fulfillment outside of your house. Companies who fulfill orders in-house may have dedicated team members who are paid to process, package, and deliver orders. Employees may also be responsible for managing inventory and processing returns or exchanges. These companies may even rely on outside warehousing solutions to store their inventory. Or they keep these products in rented commercial storage space. Regardless, insourcing orders require the use of some postal system, whether USPS or FedEx. Businesses may rely on a private carrier to deliver goods, too. There are both advantages and disadvantages to insourcing your company's order fulfillment. We take a look at both below. 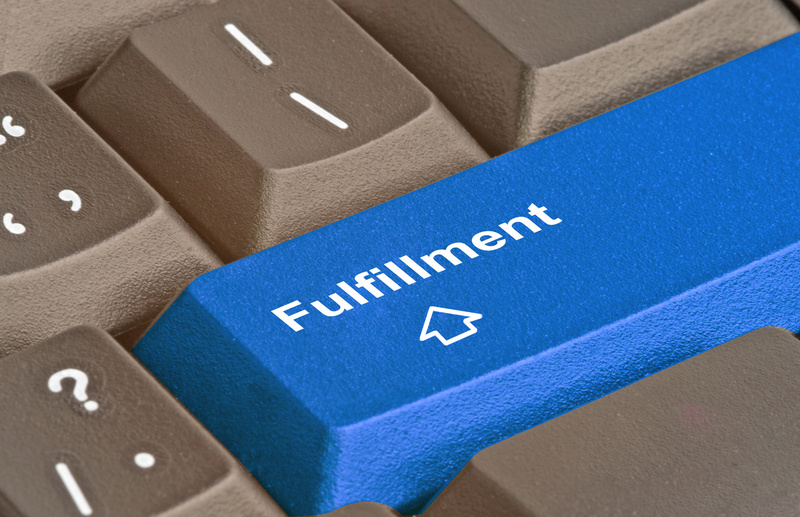 There are several benefits to tackling your company's order fulfillment. If you already insource, these are likely to sound familiar. When you handle your order fulfillment yourself, you get to engage with your physical inventory in real-time. You are the one (potentially) pulling products off shelves, packaging them, and dropping them off at the post office. This hands-on approach to inventory management can be a huge advantage, especially for small business owners. When you store your inventory elsewhere, you may lack this daily engagement with what you're producing - and how many orders you are processing. Hands-on exposure can mean more effective inventory management, especially when paired with tracking software. Plus, if you are working with a smaller inventory to start, there's no risk of losing or overlooking key orders. This can deliver higher customer satisfaction rates overall. There are many ways to cut order fulfillment costs, especially if you are strategic with packaging and flat rates. Insourcing order fulfillment isn't always the most cost-effective solution. But it can enable business owners to be smarter about packaging materials. For example, they can spend more on high-quality exterior packaging and less on interior packaging to ensure secure (and cheap) product wrapping. In most cases, they can purchase bulk packaging materials at a discounted rate. The same goes for shipping. Some carriers may offer shipping discounts or flat rates which can optimize the cost of delivery. If you are just starting out as a business, it can be tough to stay on top of things financially. You may be a one-person company! For this reason, it may make sense to insource order fulfillment. You may only have a few orders a week (or even a month) as it is. What's more, you may even be still developing your actual product. What are the disadvantages of insourcing? There are several, so be sure to keep these in mind as you weigh your order fulfillment options. We did say insourcing can be cost-effective, but only if you play your cards extremely well! In most cases, insourcing order fulfillment is more costly, especially in the long-term. In-house shipping and handling processes are incredibly time intensive. A large percentage of your valuable time as a business owner may be spent in line at the post office rather than in your office, focusing on opportunities for business expansion. Or, you may be paying several employees to process your orders. This constitutes an ongoing cost, especially if you pay your employees above minimum wage. You could also be paying more on postage and packaging materials than you realize - even if you are relying on bulk discounts! Sending out packages priced by weight can quickly become expensive, especially if you are doing so at expedited rates. Insourcing order fulfillment also may require renting warehouse space for product storage. These costs can add up, even if leasing is often calculated by the square foot. When handling shipping in-house, you do risk making inventory errors. Even if you use inventory management software, it can be easy to process an order incorrectly. You may tell a customer you have an order when you actually are out of stock, for example. Backordering can be frustrating, for both clients and business owners. If you don't use tracking software, you could be at even greater risk of error. Do you offer your customers returns and exchanges? Be careful if you do so when insourcing order processing. Returns require quick and effective handling, especially when customers need refunds fast. They also add another layer of complexity to inventory management. Some business owners can quickly become overwhelmed when processing returns on top of usual customer orders. This stress is not to be underestimated. When businesses outsource order fulfillment, they trust professionals to take care of every aspect of the product fulfillment process. That's right: an order fulfillment provider will store all your inventory items for you. They will also process orders, package them, and deliver these to customers according to agreed-upon shipping rates. Providers will also likely process returns and exchanges. They may even offer additional benefits, such as customized packaging options and freight delivery. Fulfillment providers will have pricing structures which incorporate all these services. These structures will vary depending on the provider. Some providers cater to specific industries. For example, an e-commerce order fulfillment provider will be very different from a clothing or apparel fulfillment provider. What are the benefits of outsourcing your product fulfillment? We have some ideas! In the long term, outsourcing order fulfillment can save small business owners hundreds if not thousands of dollars. This is because of a fulfillment provider's general pricing structure. When working with a fulfillment provider, you aren't necessarily paying for an individual box, flat rate delivery, employee time, and warehousing. You will be paying for these things but via an entirely different fee structure. Most providers will charge per month based off a per order cost structure. What's more, order fulfillment has it all: processing, warehousing, and delivery. Rather than paying dedicated employees to do these in-house or renting a warehouse, you can tackle all these costs at once - and at a lower rate. Let's also not forget about the time outsourcing can save you. When you entrust your order fulfillment to experts, you give yourself the time you need to focus on your business. This is where the true value of investment lies. No more waiting in line at the post office or overseeing inventory management! Put those valuable minutes to better use. Most fulfillment providers will accommodate a business's vision for future expansion. This means you won't have to worry about finding extra warehouse space if you add another product line. At Verst Logistics, for example, we provide 100% scaleable services, accommodating small, multi-client warehousing and larger, dedicated space. This means, naturally, that outsourcing order fulfillment means committing to a long-term relationship. This can be a huge relief, knowing your provider will stick with you as your company grows. Are there any disadvantages to outsourcing? Potentially. Here are some reasons why outsourcing may not be ideal for your business. Some fulfillment providers do not provide customized packaging (as we do here at Verst). Because packaging can leave a profound impression on customers, this can be a disadvantage of using an order fulfillment provider. But, plenty of providers do customize branded packages. Simply be sure your provider offers this service before agreeing to any long-term relationship. Outsourcing anything as a small business owner can constitute a serious investment. While outsourcing product fulfillment is likely to be cost-effective in the long run, it can feel like a hefty investment at the outset. For this reason, order fulfillment services are often ideal for business owners who have already launched their business and process a steady amount of orders per month. When it comes to product fulfillment, small business owners have to be on their game. Failing to deliver your products to your customers in an effective and timely manner can be detrimental to your company's plans for growth. One of the best ways you can guarantee excellent product fulfillment is to outsource these services. While there are advantages to insourcing, outsourcing product fulfillment can actually be more cost-effective. It also has less risk for error and can give you the time you need to focus on your business. Still on the fence? Why not request a free quote from us here at Verst Logistics? Or learn more about how fulfillment works here!